In literature, the classics are time-honored favorites, bestowed with a timeless vocabulary. The same holds true with the Brutocao Classic Collection. Each of these wines exemplifies the intrinsic character that made it famous - refreshing whites, robust reds and a layer-upon-layer of complexity. With cold fermentation, tropical aromas are elevated witha hint of lemon. 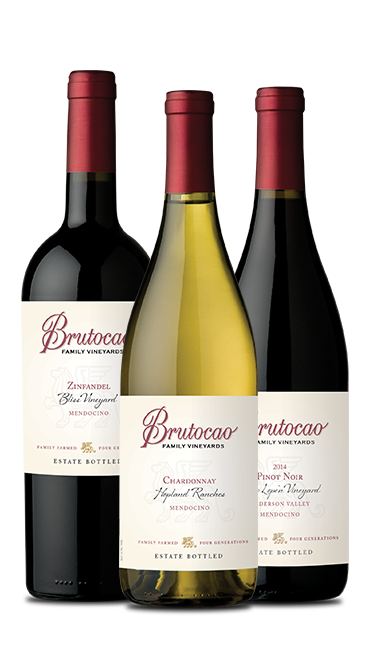 This wine greets you with a fruit forward, crisp entry with a full balanced mouth feel in te middle, finishing with citrus flavors and a touch of acid. With aromas of tropical fruits, this wine gives way to créme brulée flavors from the barrel fermentation. Additionally, it has rich fruit flacors and a dense mouth feel which is held intact witha citrus overtone, crispness, and long finish. Cherries, cola, and Christmas spice welcome you with wave after wave of aromas. The complexity of this Pinot offers a more Burgundian style with softer undertones of fruit and oak. It has a long, silky finish with hints of nutmeg, cinnamon, and cloves. This proprietary red blend begins with aromas of plum, red licorice, and dark fruit. A silky mouth feel, a deluge of chocolate and coffee, and a trickle of tobacco flavors in the middle lead into an outpouring of blackberry for a long smooth finish. Blackberries, vanilla, and pepper (white, red, or black, depending on the growing season) come through in the nose. Spices followed by a berry cobbler gives a rich mid palate that flows into a long vanilla and dark fruit finish. Plums and other dark fruit dominate the aromas, surrounded by dark chocolate and spice. The fruit in the nose is the fruit in the taste. The tannins gently wrap around the mouth, auplifting everything in the mid palate with hints of tobacco and spice. This wine has a long, inviting finish that makes you want another taste.